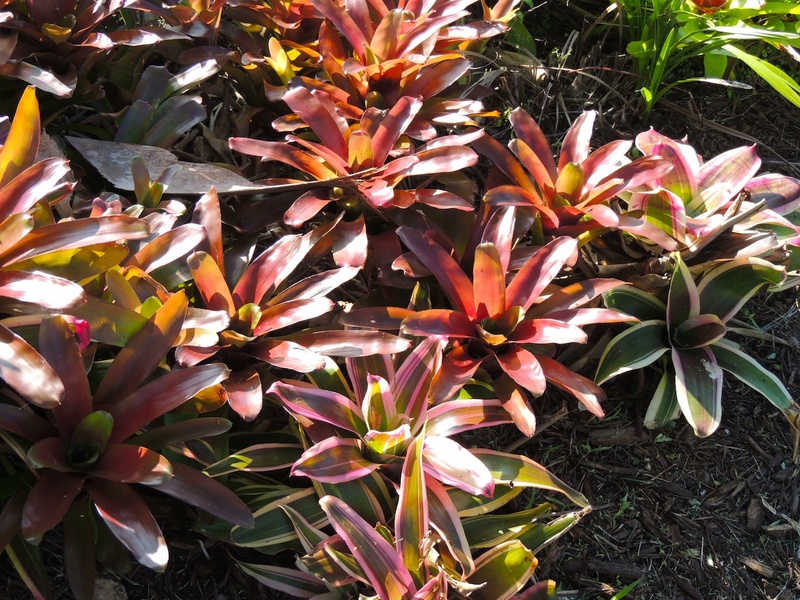 This month, Jude is asking for photos and stories about winter gardens. 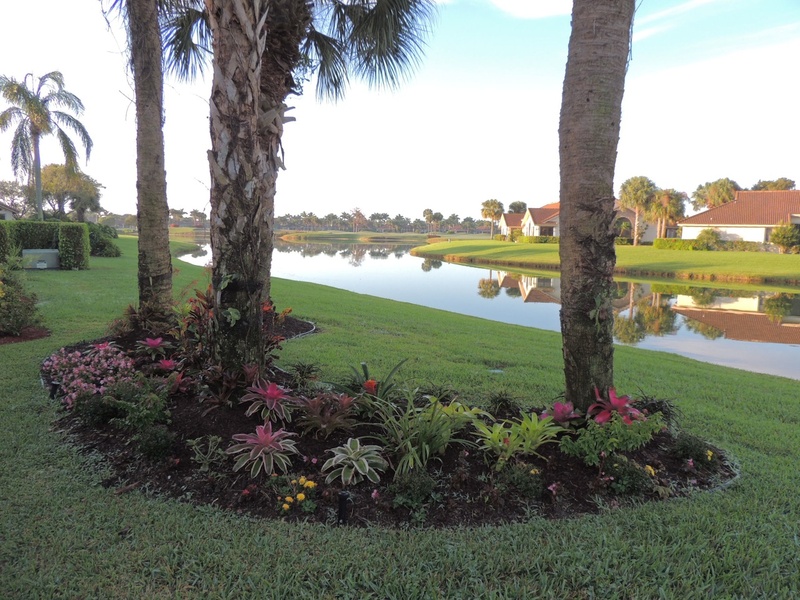 Here in Florida, ours looks pretty much the same all the year round. 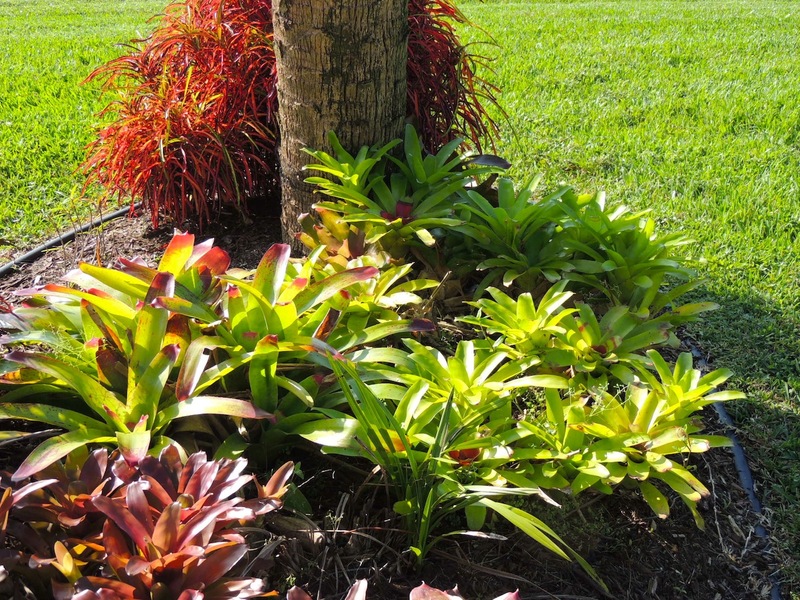 We have a flower bed out back with four palm trees, and we’ve gone for plants which don’t need a lot of attention, and which multiply rather than having to be replaced frequently. 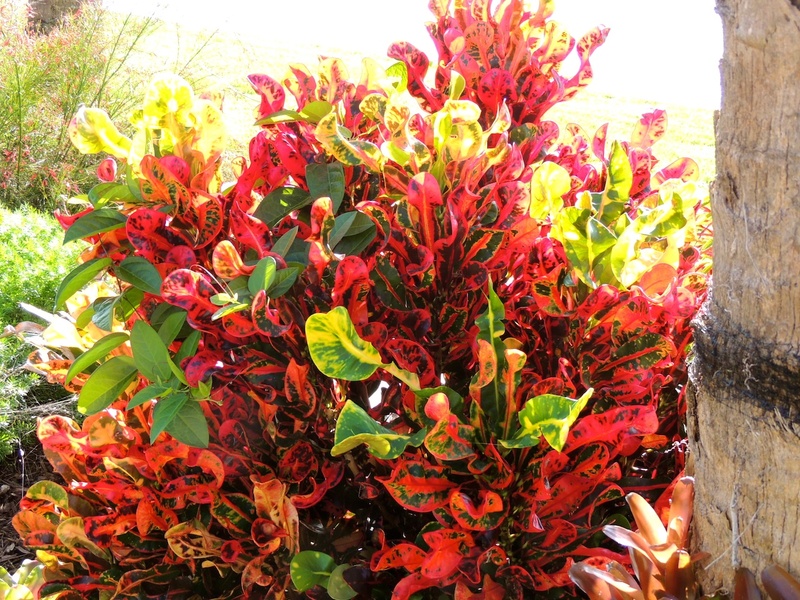 We love the vivid reds of this Croton. 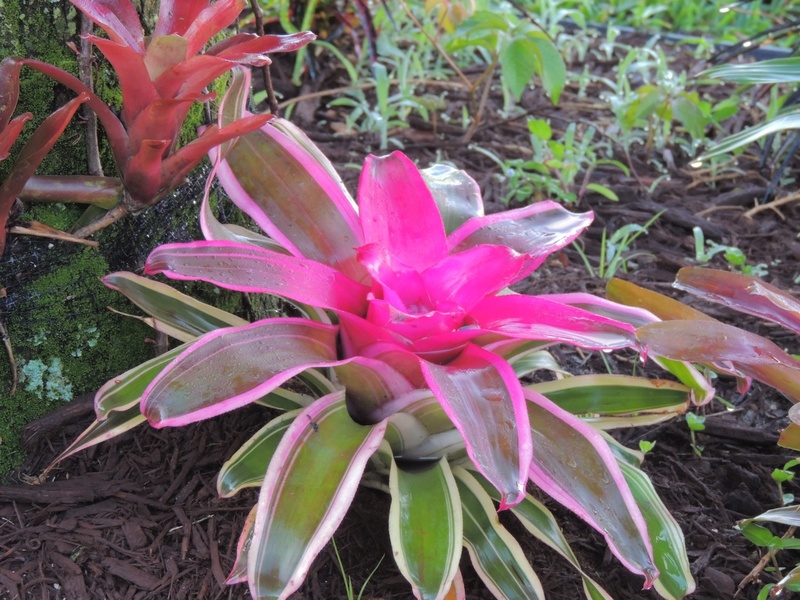 Bromeliads, which are related to the pineapple family, are also easy-care. Their waxy leaves form a bowl in which rainwater settles, and I read that inside these bowls are whole ecosystems containing such delights as small beetles, crane flies, spiders, scorpions and woodlice. 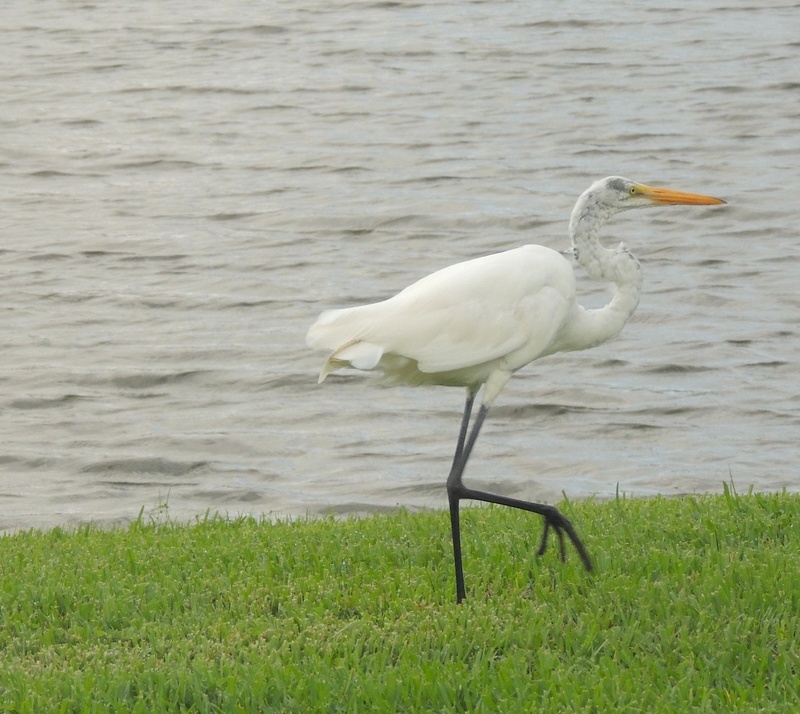 No wonder the Great Egret spends so much time inspecting their contents. Some of you may remember that he ate my poor little Lizzie when she ventured over there. We still haven’t got a replacement. I saw a tiny one on the insect screen a couple of days ago, but it didn’t take up residence. 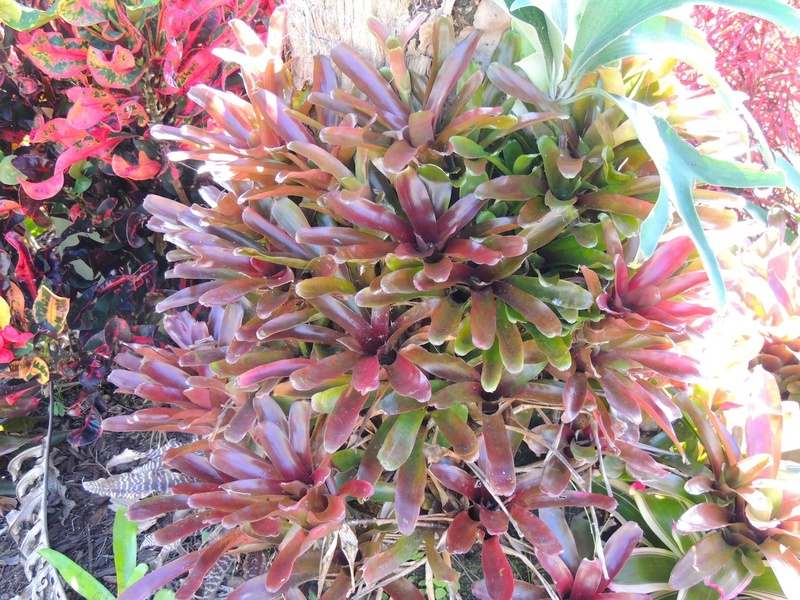 Bromeliads are epiphytes, which means that they can grow quite happily on another plant. 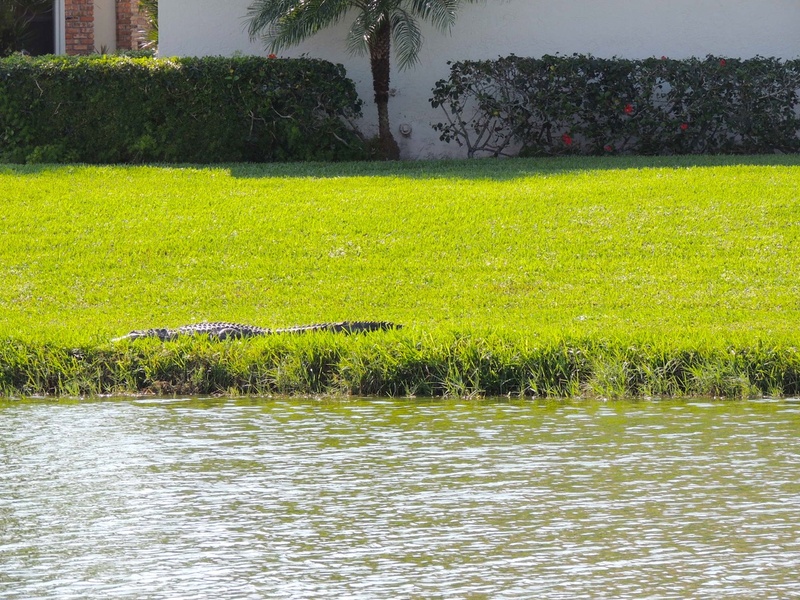 They attach themselves to the trunk of our palm trees. They can be anything from bright green to dark maroon. 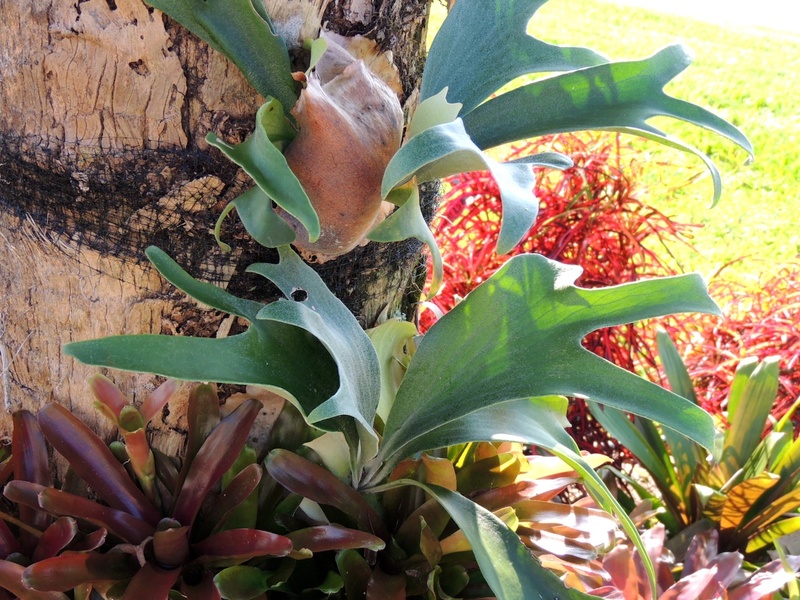 The Staghorn Fern is also an air plant, and we are very thrilled to see it doing so well. Just for good measure, I thought I’d show you our neighbour’s garden just a short distance away across the water. His plants are nothing to write home about, but he does have a rather interesting garden ornament. Our time here in Florida is almost over. We leave on Wednesday for South Africa, stopping off in England for a few days to visit my 100-year-old mom-in-law. I’m really going to miss being here. 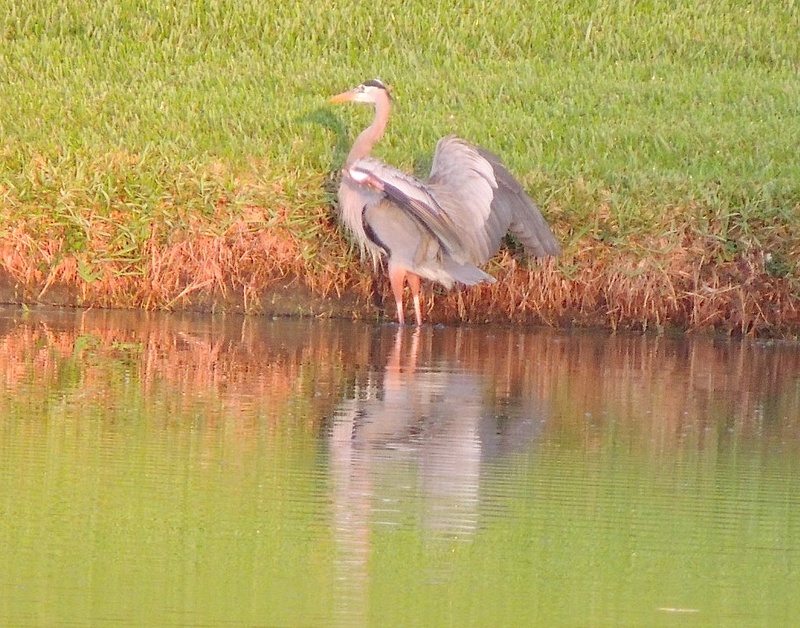 This morning, I walked out into my back yard and just gazed in wonder at the stillness and the beauty. 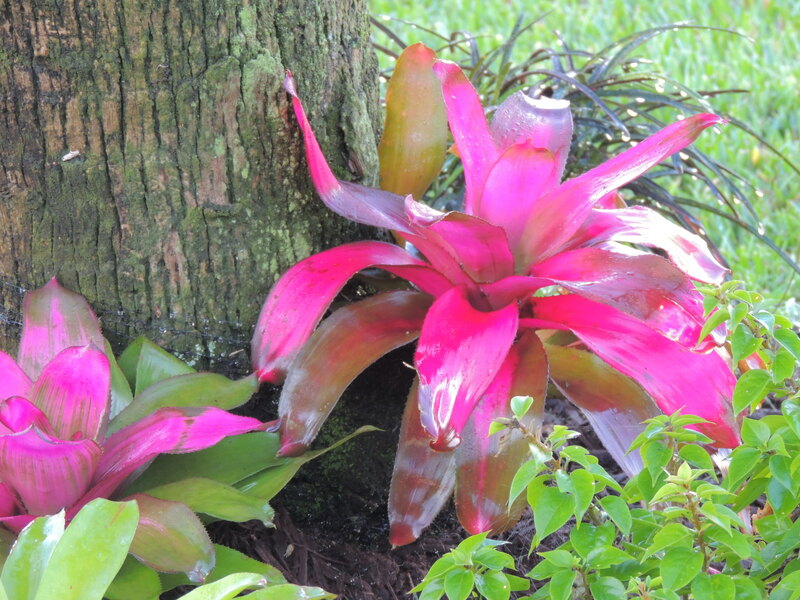 The Bromeliads we planted a few weeks ago are looking so lovely. I hope the irrigation system doesn’t go on the blink whilst we’re away, like it did last time. I’d hate to lose these beauties. I’m really going to miss seeing my feathered neighbours. 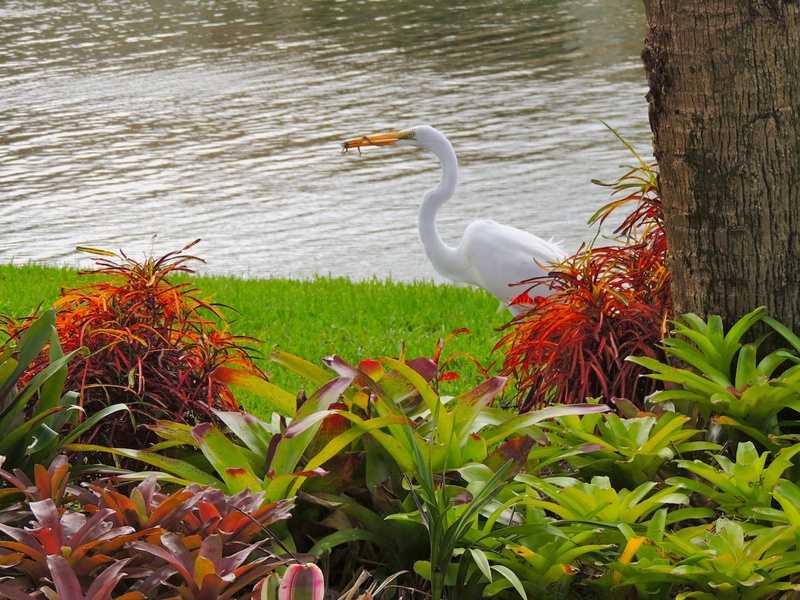 The Great Egret usually comes stalking past whilst I’m eating breakfast. 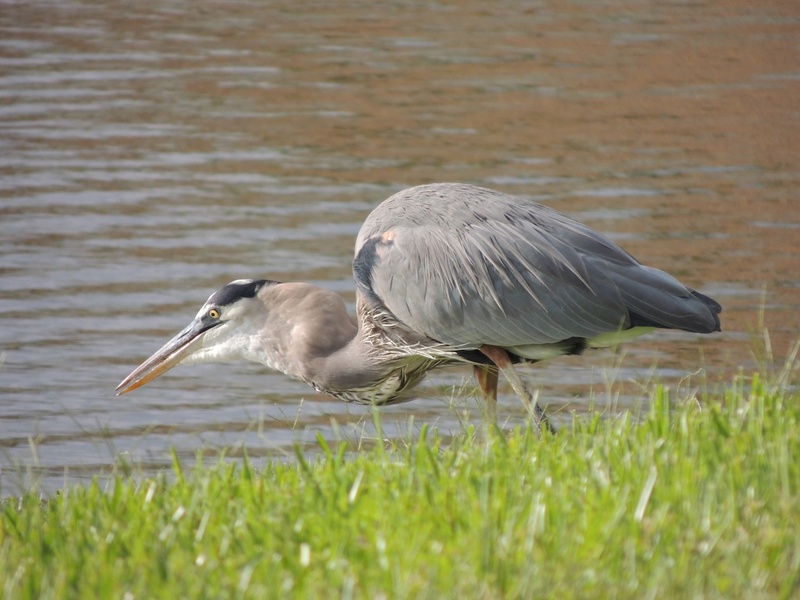 Mr Great Blue Heron who is a regular visitor on my blog, was right over the other side of the lake this morning, but I did manage a quick shot as he basked in the morning sunshine. 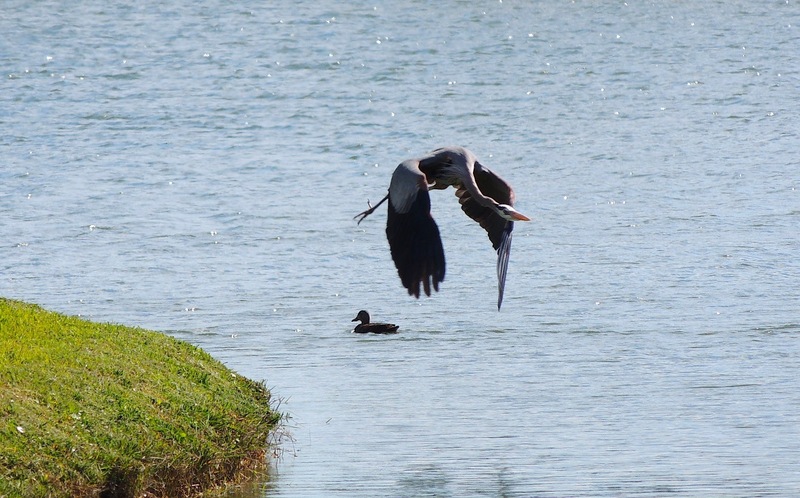 Yesterday he looked quite a different shape altogether, as his beady eyes scanned the water for a tasty morsel. I was quite pleased with how this pic of his aerobatics turned out. It’s not easy to catch him in flight. Usually by the time I’ve got the camera ready, the moment has passed and he’s disappeared. 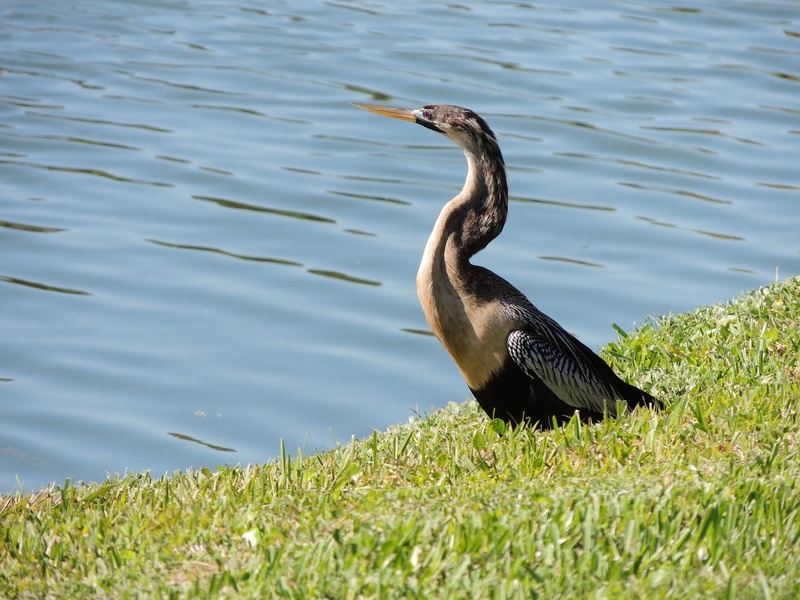 He does of course have to share his hunting ground with the Anhinga, who is always on the look out for an unsuspecting fish. 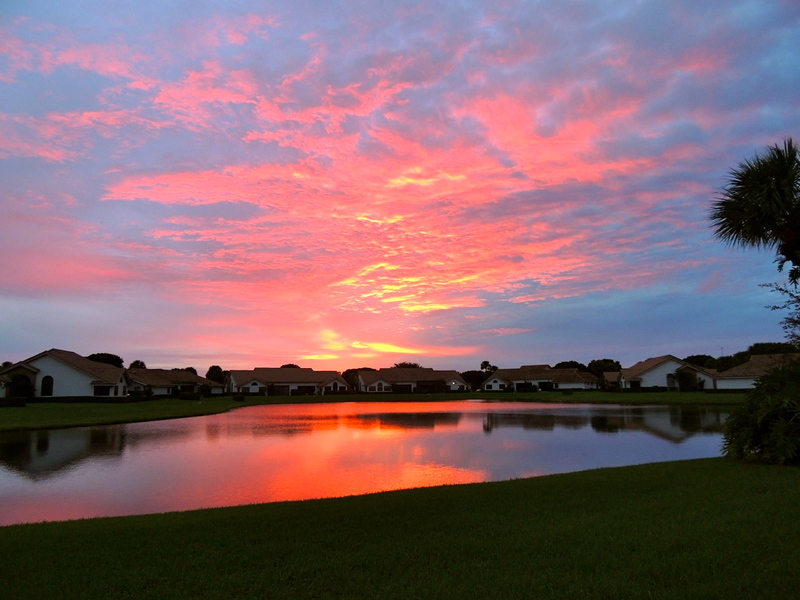 Our spectacular Florida sunsets will also have to go on without me, but I guess they’ll still be here when we return. So this will be my last post from this piece of paradise for a few months. We land in Johannesburg in a week’s time, and then it’s a one hour flight down to Durban. I’m really looking forward to seeing my sister and mom again, and also our beach. Later in March, we’ll be going to visit our daughter and family for our grandson’s 15th birthday. Hubby has just gone to meet with the roofer to discuss the other house for which we’re considering putting in an offer, so we’ll see what transpires about that. I have a load of packing to do now, as well as preparing the house for our 6-8 month absence, so if you don’t see me in your likes and comments for a few days, please know that I will be back as soon as I can find some time to play again. Love and hugs to you all.